Lodge Pro-Logic Dutch Oven Smooth Distribution, Retention, and Cooking VersatilityCompany's coming ...your Pro-Logic Dutch Oven will cook and serve your family favorite handsomely. Cover included. Beautifully designed cast iron cookware that will compliment any kitchen. Pro-Logic skillets are designed with sloped sides, and loop handles that make handling them easy. The Lodge Cast Iron Dutch Oven is a multi-functional cookware that works wonders with slow-cooking recipes. It comes with a tight-fitting lid that helps lock in nutrition and flavor. This pre-seasoned Dutch Oven works like a charm right out of the box. Made of cast iron, this Dutch Oven evenly distributes heat from the bottom through the sidewalls. Also, it retains heat better so your delicious meal remains warm for a long time. Sporting a stylish black color, the cast iron Dutch Oven looks good in most kitchens and it doubles up as an excellent source of nutritional iron. It features loop handles for convenient handling and the oven is easy to clean and maintain. A simple Cast-Iron Dutch Oven, like the one your grandmother used, still ranks as one of the best cooking utensils ever made. It gives you a nearly non-stick surface, without the possible harmful fumes generated by preheating chemically treated nonstick cookware. Many of the pieces of cast iron cookware made in the Lodge Foundry over a century ago remain in use today. Features: Made of cast ironPre-seasoned and ready to useMulti-functional cookwareVirtual Non-stick surfaceWorks with induction stove topsBrutally tough for decades of cookingEasy to clean: hand wash, dry, rub with cooking oil. Even, Gentle Heating Detailed Highlights: Multi-Functional Cookware The right tool for searing, sauteing, simmering, braising, baking, roasting, and frying. Made of Cast-Iron Cast-Iron is a form of cookware developed over a millennia ago remains as popular today as when it was used to prepare meals hundreds of years ago. Cast Iron is one of only two metals compatible with induction stovetops. Unparalleled in heat retention and even heating. Can Be Used With A Variety of Heat Sources At home in the oven, on the stove, on the grill or over the campfire. Skillet may be used on various heat sources including gas, electric, induction and ceramic-glass top stoves and ovens. When using on glass stove tops, be careful not to slide the cookware around as it's possible to scratch the surface. Seasoned cast iron can also be used on the grill or outdoor fire and coals for camp cooking. Begin heating cookware on low and slowly bring heat up to medium or medium/high. Always remove cookware from the stovetop after cooking. Pre-Seasoned Seasoned for a natural, easy-release finish that improves with use. Seasoning is a necessary step in using cast iron cookware. Oil is baked into the pores of the iron at the foundry to prevent rusting and to eventually provide a natural, non-stick cooking surface. Unlike synthetically coated cookware, it is possible to restore the cooking surface of cast iron. Lodge uses a proprietary soy-based vegetable oil to season our cookware. The oil contains no animal fat or peanut oil. The seasoning is functional application and slight inconsistencies may appear in the seasoning finish. The inconsistencies will not affect cooking performance. Easy to Care for Hand wash, dry, rub with cooking oil. It is very important to replenish the seasoning of your cast iron cookware by applying a thin layer of oil after each cleaning. Seasoning is an on-going process. The more you use cast iron, the seasoning is improved. Using Your Lodge Cast Iron Rinse with hot water (do not use soap), and dry thoroughly. Before cooking, apply vegetable oil to the cooking surface of your pan and pre-heat the pan slowly (always start on low heat, increasing the temperature slowly). Once the utensil is properly pre-heated, you are ready to cook. TIP: Avoid cooking very cold food in the pan, as this can promote sticking. PLEASE REMEMBER: Handles will become very hot in the oven, and on the stovetop. Always use an oven mitt to prevent burns when removing pans from oven or stovetop. Care and Cleaning of your Lodge Cast Iron After cooking, clean utensil with a stiff nylon brush and hot water. Using soap is not recommended, and harsh detergents should never be used. (Avoid putting a hot utensil into cold water. Thermal shock can occur causing the metal to warp or crack). If you are having trouble removing stuck-on food, boil some water in your pan for a few minutes to loosen residue, making it easier to remove. Towel dry immediately and apply a light coating of oil to the utensil while it is still warm. TIP: Do not let your cast iron air dry, as this can promote rust. Store in a cool, dry place. If you have a cover, or lid, for your utensil, place a folded paper towel in between lid and utensil allowing air to circulate. This prevents moisture from collecting inside the utensil, which can cause rust. TIP: The oven is a great place to store your cast iron; just remember to remove it before turning on the oven. NEVER wash in dishwasher. If for some reason your utensil develops a metallic smell or taste, or perhaps rust spots (maybe a well-meaning relative washed your utensil in the dishwasher or with soap thinking they were being helpful), never fear. Simply scour off the rust using a very fine grade of sandpaper or steel wool and refer to our section on re-seasoning. Re-Seasoning your Lodge Cast Iron While maintaining the seasoning should keep your Cast Iron in good condition, at some point you may need to repeat the seasoning process. If food sticks to the surface, or you notice a dull, gray color, repeat the seasoning process: Wash the cookware with hot, soapy water and a stiff brush. (It is okay to use soap this time because you are preparing to re-season the cookware). Rinse and dry completely. Apply a thin, even coating of MELTED solid vegetable shortening (or cooking oil of your choice) to the cookware (inside and out). Place aluminum foil on the bottom rack of the oven to catch any dripping. Set oven temperature to 350 � 400 degrees F. Place cookware upside down on the top rack of the oven. Bake the cookware for at least one hour. After the hour, turn the oven off and let the cookware cool in the oven. Store the cookware uncovered, in a dry place when cooled. Why should I choose Lodge cookware over other brands? For over 112 years, Lodge has provided quality cast iron cookware and accessories, with a broad and innovative assortment. Our continued commitment to quality enables Lodge to offer a superior product line. How is the diameter measurement of Lodge Cookware determined? We measure from outside rim to outside rim across the top of the cookware, not the bottom. What type utensils are recommended to be used with Lodge products? We recommend using wood or silicone utensils to avoid scratching. Why should soap or detergent not be used to clean cast iron cookware? Soap and detergent are used to break down and remove oils. Since the seasoning of your cast iron consists of oil, cleaning with soap will strip or remove the seasoning from cookware. Are there any types of food that are not recommended to be cooked in cast iron cookware? Foods which are very acidic (i.e. beans, tomatoes, citrus juices, etc.) should not be cooked in a cast iron utensil until the cookware is highly seasoned. The high acidity of these foods will strip the seasoning and result in discoloration and metallic tasting food. Wait until cast iron is better seasoned to cook these types of foods. Lodge is a Green Foundry: Lodge is a zero hazardous waste stream foundry. Lodge designed a vegetable oil recycler for the seasoning process to reduce waste and unusable oil is recycled and used as biodiesel generator. Lodge uses recycled and biodegradable packing materials. Reuse of foundry sand used in the casting process is recycled and unusable sand, working to purify the water of the local streams and planting trees to improve air quality and beautification. Lodge History: Lodge is the oldest family-owned cookware foundry in America. Since 1896, the Lodge family has been casting premium iron cookware at their Tennessee foundry. Starting with raw materials and finishing with their seasoning process, they continue to improve on the highest quality standards that go into every piece we make. As the sole American manufacturer of cast iron cookware, they are proud to carry on the legacy started by founder Joseph Lodge. Lodge doesn't just make cast iron; they make heirlooms that bring people together for generations. Mini Cornbread/muffin pan made of cast iron for slow, even heating. Six 2.5-inch-wide by 1.5-inch-deep impressions. Pre-seasoned with vegetable-oil formula and ready for immediate use. Pan measures 7.62" x 5.25" x 1.5". The Lodge 10.5-inch Single Burner Reversible Grill/Griddle conveniently fits over a single stovetop burner, offering a smooth side for bacon and eggs and a ribbed side for grilling up some burgers.The grill/griddle provides fast, even heating for searing, baking, broiling, frying or grilling. At home in the oven, on the stove, grill or over the campfire, and can be used on induction cooktops.Two easy grip corner handles ensure simple lifting, flipping or hanging when not in use. Measures 10-1/2 by 10-1/2 inches. 12 INCH PRO-LOGIC SEASONED CAST IRON SKILLET This unique design gives you the traditional benefits of cast iron with a modern twist. The updated handle, sloped sides and innovative loop assist handle bring a contemporary look and feel to your kitchen, allowing you to pan fry the perfect egg, or easily grill up some brussel sprouts over an open flame.CARING FOR YOUR CAST IRON Caring for your cast iron doesn’t have to be complicated! Lodge cookware is pre-seasoned, so you can make your family's favorite recipe without needing to season the skillet first. You can use it on the stove top or the campfire (just not the microwave). Grill fresh salmon or bake some warm buttered biscuits in your skillet, enjoying the easy-release finish that cast iron is known for.After hand washing your cookware, simply place it on a burner for a few minutes and then rub in a thin layer of oil to help maintain your hard earned seasoning.LODGE MANUFACTURING COMPANY Founded in 1896, the Lodge family has been making high quality cast iron for over a century. Joseph Lodge created a legacy that has lasted through more than half of U.S. history. Even during the challenging times, like the Great Depression, the Lodge family has been committed to keeping their employees and their families afloat. Novelty items such as cast iron animals and garden gnomes were sold in order to keep paychecks coming and families fed.The Lodge Manufacturing Company is still family run, with both CEO’s being the great-grandsons of Mr. Joseph Lodge himself. As technology has evolved overtime, Lodge has seamlessly stepped up to the plate with innovative products and patented technology. PROUDLY MADE IN THE U.S.A. For over 100 years Lodge has been dedicated to manufacturing quality cast iron products that can be passed down from one generation to the next. From summertime campouts to Sunday night dinners, Lodge is happy to be at home on your table. 12 INCH CAST IRON SKILLET. This seasoned cast iron skillet has a modern design and is ready to use. It's perfect for induction, gas, electric, or glass cooktops. It can be taken from the campfire to the stovetop or the oven to the grill, making it at home in every kitchen. PRO-LOGIC DESIGN. Give your kitchen a modern edge with the Lodge Pro-Logic line. This design is made for the innovative cook or chef. It features updated handles and sloped sides, with the same timeless cast iron function that you know and love. MAKE EVERY MEAL A MEMORY. Lodge knows that cooking is about more than just the food; it's about the memories. This dynamic 12" skillet can be used for weeknight grilled chicken or summertime BBQs with roasted veggies. The Lodge Cast Iron 2-Quart Serving Pot is a multi-functional cookware that works wonders with slow-cooking recipes and all your favorite foods. Cook up baked beans, soups and stews. This cookware piece goes from stovetop to tabletop for serving. Cast iron loves a campfire, a stovetop, or an oven, and can slow-cook foods without scorching. It retains heat well so you can sear meat at higher temperatures and will keep your delicious meals warm for a long time. Whether used in a kitchen or camp, theses virtually indestructible cookware should last for generations. Made of cast iron, this pot evenly distributes heat from the bottom through the sidewalls. 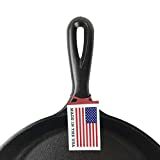 Sporting a stylish black color, the cast iron cookware looks good in most kitchens and it doubles up as an excellent source of nutritional iron. This pre-seasoned cookware is ready-to-use right out of the box. While the cookware comes pre-seasoned to prevent food from sticking, it works best when sprayed or lightly coated with vegetable oil before use. The Lodge seasoning procedure is a multiple-step process in which the seasoning oil is applied via an electrostatic spray system that coats the cookware, then it’s baked in commercial ovens at very high temperatures. This allows the oil to penetrate deeply into the pores of the iron. This seasoning process achieves a seasoned finish that would take many months of home use to achieve. Sometimes during this process, the seasoning oil can collect and create a bubble or slight drip at the bottom of the pan as it’s hanging through the production process. And that in turn can turn brown as it’s processed through the seasoning ovens. This brown spot is not rust but in fact, carbonized seasoning and will darken with use. The factory seasoning process makes Lodge cast iron products ready to use right out of the box, and the product over time “Just keeps getting better”. After cooking, clean with a stiff nylon brush and hot water. Using soap is not recommended, and harsh detergents should never be used. Towel dry immediately and apply a light coating of oil to utensil while it is still warm. Cast Iron, like your grandmother used, still ranks as one of the best cooking utensils ever made. It gives you a nearly non-stick surface, without the possible harmful fumes generated by preheating chemically treated nonstick cookware. The American-based company, Lodge, has been fine-tuning its construction of rugged, cast-iron cookware for more than a century. Measures 8-inches in diameter and 2.875-inches deep.